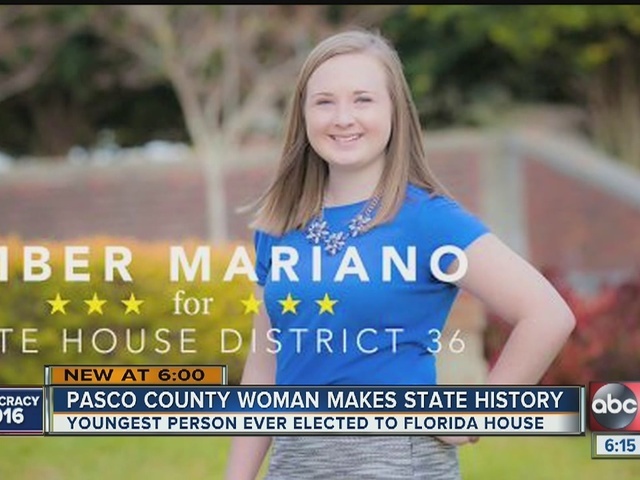 She’s barely old enough to drink and hasn’t finished college yet, but a 21-year-old Pasco County woman will serve in Florida’s House of Representatives. She’s the youngest person ever elected. “It was honestly the best night of my life,” said Amber Mariano, less than 24 hours after her win. While most college students watched the election as spectators, Mariano is part of it all. She just turned 21 three weeks ago. “From voters, you’d be surprised. You’d think they would be like oh wow, you are too young to be doing this, but everyone that I met said wow, you are doing this so young. That’s what we need,” she said. Mariano, a senior at University of Central Florida with plans to go to law school, topped Democratic incumbent Amanda Murphy in House District 36. The district includes Hudson and New Port Richey. Mariano won by just 748 votes. “Balancing school, balancing work was a lot to handle. But the work doesn’t stop here. I have two years now to do the best I can for my community in West Pasco. I’m so honored to be able to serve them,” she said. Mariano grew up around politics. Her father Jack just won his 4th term on the Pasco County commission. Now she out ranks dad. “We didn’t expect this opportunity to present itself so quickly in her life. But I will tell you at six years old she said she wanted to be the first woman President,” said Jack Mariano. “He says I’m leap frogging him. He just wanted me to follow my dream. And this is my dream,” she said. Mariano may be 21, but she already has some powerful friends, getting endorsements along the way from Governor Rick Scott and Senator Marco Rubio.